Critical thinking is an essential life skill. It lets us make good decisions and can protect us. People don't exercise it all the time, but people who exercise it more tend to be more successful. And people who fail to exercise it can become victims of one sort or another. So I wanted to comment on some current examples where critical thinking helps. The term "Greenwash" has been around for about 20 years but has only recently made it into the mainstream. Basically, Greenwashing is about companies exaggerating and overstating their environmental contribution. An advertising con-job carried out on the public. Often where companies spend more advertising their greenness than actually contributing to the environment. For a history and definition see Wikipedia, here. For a consumer index, see the Greenwashing Index, here. Companies marketing products have a long history of spinning the benefits of their products even when the benefits are dubious. The spin can range from the relatively harmless, such as stating what a product already does, to deception, such as deflecting attention away from a problem area. Critical thinking can help you see through this. Update: I saw a related survey on "What should we do about bogus ‘green’ technologies?" at another Scouters blog. The term "Security Theatre isn't as mainstream yet. It refers to security measures that give people the illusion of security rather than providing real and measurable security. A lot of the security measures put in place since 9/11 fall into this category. The Chaser, an Australian team has made fun of this with such episodes as "Airport Security" and the "Trojan Horse". Video clips are available on You-Tube here and here. The TV series "Boston Legal" dedicated part of an episode to the absurdities of the no-fly list. An audio clip can be found here (mild language warning). The world is full of doomsday prophecies and other bunk. A healthy does of skepticism is useful for dealing with extraordinary claims. There are lots of people who will waste your time seeking attention, money, and fame. All of this they take from you without providing anything of value back. The end of the Mayan calendar in 2012 predicts the end of civilization. This is no more true than suggesting the earth would end after December 31st, 999AD or 9999AD - the calendar is just a bit stranger. See here and here. Planet X is coming to destroy us. Planet X was originally an astronomical reference to a presumed missing planet or unknown planet beyond Neptune. Pluto didn't fit the bill and it took over 50 years to resolve the facts. Later the name was usurped by conspiracy theorists. The predictions aren't supported by facts and the date for doomsday has been revised. See articles, here, here and a series of articles here. Update: The crop of bunk surrounding 2012 never seems to to end. Fear mongers and misguided folks keep reviving it and scaring people with these fabrications. Dr. Ian O'Neill at Astroengine has written a fine series of articles debunking these. Have a look at 2012 Doomsday Fabrication: Abusing Science and Making Money. Asteroid 2007 TU24 near miss disasters. For a description of this rock see Wikipedia. For the debunking see this and this. For a told-ya-so, see this. So exercise your critical thinking and save your time and money. Better don't let the fear mongers profit! People are often predisposed to believe in a cause. The problem with this is that people often suspend their critical thinking and can be taken in. They can overreact to circumstances. Or they can mis-evaluate the situation. To demonstrate this, a group took a petition to an environmental event. The petitioners (correctly) claimed that there was a substance associated with all major sources of water pollution and sought a ban on the chemical. What was it? Check out dhmo.org for a wealth of information of dihydrogen monoxide (dHmO, aka H2O). Sadly, a large number of people just listened to the spin and signed the petition to ban water! While there is nothing wrong with wanting to believe or belong, we still need to be careful to apply some critical thinking. A new Space Carnival, #54, has been posted at Altair VI. Click here to read it. 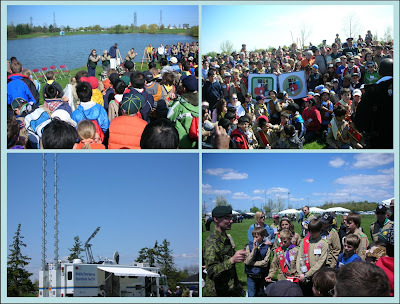 The 433rd attended the Emergency Preparedness Adventure Day and a great time was had by all. There was an opening sing song, followed by the unveiling of the new Emergency Preparedness Award (Cubs) and Badge (Scouts). The Provinces Emergency Mobile Operations Center was there. And the Armed Forces communications and rescue teams too. We learned about first aid and what to pack in our emergency kits. There were some great giveaways including a very cool flashlight that could work on several common types of batteries. It also had feet so it wouldn't roll away. (Oddly the above link was one of the few local stores with the light on their web site). 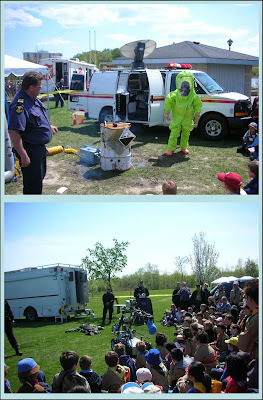 Probably the favorite event of the day was the OPP response team's bomb watermelon disruptor! Update: Some people aren't seeing the image properly. If the image above doesn't display properly try here or here. Thanks. Update: If you are having problems with the last image, we'll look into it and try and fix it soon. I'll post an update when I have news. Thanks.Thanks to Baloo for fixing this. Yummy Science Experiment - eating up the speed of light! The folks over at the Orbiting Frog came up with this yummy science experiment. It turns out that anyone with a microwave (with turntable), microwave safe dish, a ruler, and yummy marshmallows or chocolate chips can measure the speed of light! I haven't looked but I'm certain this could be worked into a badge somewhere. 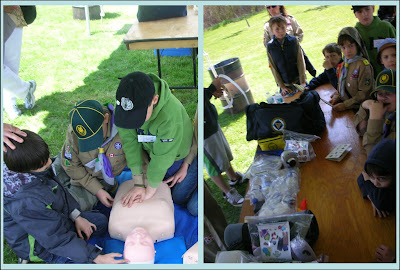 Cubs doesn't have a science badge, but Scouts do. Heck why should Scouts have all the fun. Brilliant folks! We need more edible (or gooey) science experiments. I'd like to propose a modest project. To gather a collection of one of each astronomers badges from Scouters across the world. Phase one would be a virtual collection. Please send me a digital photo of the badge and a photo or scanned image of the badge requirements. Please include group information and address. I'll put the collection together and make it available later. I'm thinking that I'll use the information in a Google map (like the map of the Solar System in Toronto in Astronomical Distances). And I'll track progress below. Later it would be very nice to arrange a physical collection. I'd be willing to send a Canadian Astronomers badge to other Scouters that send me one from their country. But I want to coordinate this on a first come first serve basis so I don't have a bunch of folks send badges from the same place. If you are interested in this second phase, please contact me by email to coordinate an exchange. Anyone wishing to send me one from their country can contact me at the email address on the sidebar (its obscured as an image so I don't get buried in spam) using the E-mail Me link under Contact and the GuestBook widget on the sidebar. Note: contact information will not be published. May 10th is Astronomy Day. In addition to specific Astronomy day activities there are some resources for kids such as templates for colouring pages and mobiles. For more information see this article. 13% Build your own Planisphere (Star Finder)! 3% How many planets have rings? People find sites in two main ways. Direct references linked from other sites (or in emails) and through search engines. While I can't say much about the unreferred sites, people following direct links from Carnivals, emails, and other scouting links have a pretty good idea what they're getting. One place where it gets interesting is traffic coming from search engines. So, what are people searching for? Now some of these results were a bit of a surprise. In part this is because blogs tend to grow organically. I was pleased with the results for the star finders and finding your way without a compass. I was hoping for this, so when I wrote them I didn't limit them to my location. I specifically made sure to find out how this would work in the southern hemisphere and not just up north here in Canada. One of the reasons for installing website tracking capabilities is to help web site authors and managers to tune the site to their audience. There are lots of tools for doing this but many of these use the same basic techniques. For a discussion of these, see "Understanding website tracking". Search terms if the visitor came from a Search Engine. And, of course, what pages were visited. Khan's Scopes on Dufferin (east side, south of Yorkdale) have a twice yearly tent sale. The spring installment is this Saturday. If you're in the area, it's worth checking out. Their web site is here. If you see Ray, tell him George :), David, Mang says hi. In my hunt for good Scouting resources, I came across a blog that consistently shows Cubs involved in fun activities. A lot of these go the extra step with a little well prepared embellishment. Why just play capture the flag when you can play capture the pirate treasure, see Pirates! Cubs a bit overheated? Need a steam off game? Try some Icy Water! Feeling gooey? Take your cubs for a trip through the graveyard! Or try some reality Cubbing like Survivor! Joy has lots more, so check it out. Most web sites track their visitors for any of a host of reasons. What the operators do with that information depends on their motives and intent. I track visitors to this site using a free service called Statcounter. My motives are to understand my audience better. One example of this is my article "Browser Wars part Deux". Others track for security, or ad revenue, or more sinister purposes. We as an audience may choose to agree or to disagree with how we are tracked and why. There is a lot of misunderstanding out there about security and privacy on the Internet and during our browsing experience. Trying to understand the ins and outs of all of this is technical and a bit arcane. Most people don't have the time, patience or the background for it. I do. It's part of my job. Information security has been part of my job for most of my career. With security and privacy, most of the time people get upset about the wrong things. It's not that their concern is misplaced, it just that people aren't that good at estimating risks. Sometimes we choose to give up a bit of our privacy for things like free email accounts. Most people believe that companies like Google use their free email as vehicle to deliver ads. Automated analysis suggests something you might want. The most successful companies doing this will be the ones that are effective (suggesting something you really want or need) and not offensive or pushy. Occasionally, these services get it wrong and the results can be quite funny. Because this blog is hosted by Google, I use a Google account just for it. A lot of the emails going through relate to scouting and astronomy. Google, through Gmail , displays a line at the top of my inbox informing me of interesting products and services. Sometimes it tells me about things relating to camping or astronomy. Regularly, it tells me about astrology, or doom and gloom sites (Nostradamus), and other weirdness. I don't mind it as it's not too pushy. Website visitors are typically tracked by IP addresses and "cookies". Many people get upset about companies tracking their browsing habits. It's seen as an invasion of privacy and been the focus of a wide debate. The other part of the problem is their use by spammers and criminals. As with most things, organizations that are the most aggressive in their use of technology tend to cross a line and become the focus of intense debates such as this. The debate then focuses on the use, abuse, and perceived abuse of the technology which then becomes a question of trust. This is no different from your real world business choices. The first thing people need to know is that not all tracking is bad. In fact, some is necessary. To tell the difference, you need to understand how tracking works. There are several methods described below. If you don't want all the nitty-gritty read the italic paragraphs in each section. People are tracked by means of IP addresses, Cookies, Web Bugs, and by coordinating the use of these things. Cookies and Web Bugs can even track you as you move a laptop from one place to another (e.g. home, work, hot spots). Basically, IP addresses aren't all that good for tracking people by themselves because they can be shared and because they don't remain constant. If you want to see your IP go to What's my IP address. That may change in the future as we change to a newer standard for IP addresses called IPv6 which is intended to allow every device to have its own unique IP. If you want to know more about how this works read the points below. Otherwise skip a bit. IP stands for Internet Protocol. IP addresses are how are computers know to talk to each other. When you visit this blog, your browser needs an IP address. You type mangsbatpage.433rd.com and your browser asks the Internet's Domain Name System (DNS) to return an address. Today it sent back 72.14.207.121. Because this is a server at Google, it's unlikely to change too often. The computer I'm writing this on also has an IP address. It's dynamic and assigned by a home firewall/router. It's also private and can't be seen on the Internet. Finally there is the one that my firewall/router has. That one is assigned by my ISP dynamically and changes from time to time. It can be seen on the Internet. That one is also shared by other computers in my house. IP addresses were intended to be unique. In practice their aren't enough of them and they get shared and reused. As a result, they aren't in themselves all that good at tracking people. As I mentioned, some IP addresses are dynamic and change over time. Other IPs are fixed and represent many people. Large companies typically funnel all of their employee browsing through a few IP addresses. While most Internet Service Providers assign individual IP addresses to customers, AOL is (or was) a counter example and operated much like a large company. IP addresses in and of themselves aren't a great indicator of individual behaviour. There should be a healthy privacy debate around IPv6. Cookies are more commonly used for this tracking and as a result they are both abused and misunderstood. Cookies are essentially a way of associating information with a name to provide a memory for web servers. That's actually needed because in their basic form web servers can't tell one page request (or people) apart. Cookies that are very specific and restricted facilitate transactions. Cookies that are broad and unrestricted are open to abuse. Web servers are "stateless" which is just a fancy way of saying that they have no memory from one page to another. This is fine if the site is just only informational. If there is some kind of transaction happening the site must have a memory. You wouldn't want it any other way. That's one reason why the banks encrypt their sessions. The random number must be extremely strong to prevent guessing. The random number is only good for a short while. When it expires, you must login again. Some web sites change the random number from page to page. Wikipedia has an article on Cookies here. Another way you can be tracked is by the use of so-called "web bugs". These are references to invisible files hidden in a web page that are associated with a unique number. By embedding the same bug in emails and different web pages along with additional reference information, you can be tracked. Unlike cookies and IP addresses, I'm not aware of a clear need for web bugs beyond tracking. In fact there are lots of examples of abuses using this technology. Web bugs are often image files such as JPEGs that are drawn with a 1 pixel x 1 pixel size. There are other methods and a broader description can be found on Wikipedia. The bug is really the reference and not the file. Tracking is possible because the name of the file and the unique number appear in the logs of servers you visit. Several email products can disable web bugs. If you are doing transactions like banking, you might want to shut down your browser and start it up from scratch to do your banking and shopping. When done the shut down and restart again. This will minimize the possibility of information accidentally leaking between different web sites. Most browsers allow you to select which cookies you'll allow to be set. You can also block entire sites and networks. The down side is that the frequent interactions when the browser asks you about each cookie can be highly annoying. There are also cookie managers that allow you to remove and block unwanted cookies. Java script can be even more dangerous in what it can steal from your computer. I strongly recommend people use tools like Firefox's NoScript Add-on. This allows you to permit specific sites to use scripts. Texas parks and recreation's blog had this article. The suggestions cover a wide age range and a lot of core Scouting activities. Thanks to the Awesome Cub Scouting blog, here. The event will be held near the Conservatory (Site #8 on the map off Rathburn and Elmcrest) west of the Olympium. See the official map of Centennial Park, here (warning large download). Parking near the site is limited and we will probably use the large lot between the Olympium and the Stadium about 600 meters from the site.